Just run it and then load web page http://192.168.0.7:8080, where 192.168.0.7 is IP address of the Linux machine you’ve started above mentioned bash script. You’ll see links to files located in directory the script was started at. My respect to Alexey Sveshnikov. P.S. 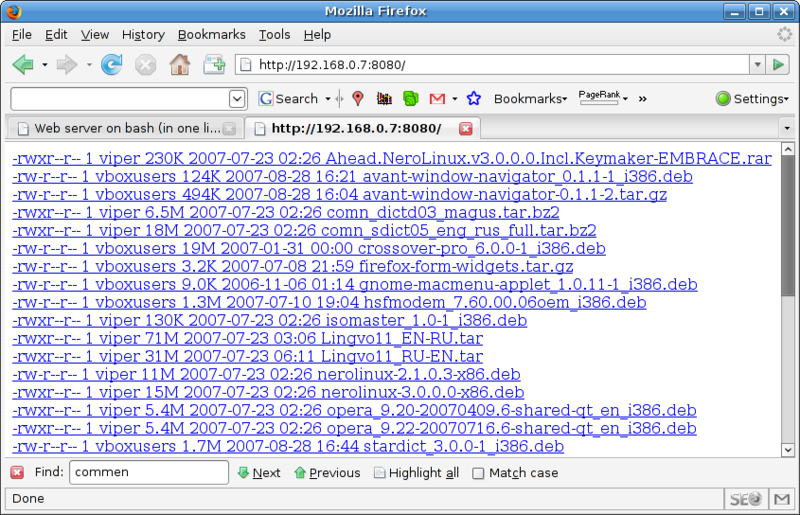 Script was tested at Ubuntu and Debian Linux. $e "<a href="/$n" rel="nofollow">`ls -gh $n`"
$e "$o$c-Type: `file -ib $f`n$c-Length: `stat -c%s $f`"
$e -e "$h 404 Not Foundnn404n"
Good work Erdem Güven! But you didn't add just the directory browse support, now you can see every file you have on you computer, not just the ones you put in the same folder where the script is. Einen tollen Artikel hast du hier geschrieben. Dieser Artikel hat mich irgendwie animiert auch wieder mehr zu bloggen, werde mich jetzt gleich mal hinsetzen und einen neuen Posts posten. I just discovered your blog right now and I have to say that I am not disappointed. Keep up the fantastic writing. What a great blog. I've enjoyed digesting through your site in the last week. Extremely rated post. I learn something totally new on totally different blogs everyday. Deciding on one . stimulating to learn the paper content from different writers and learn a little bit one thing from their website. I’d like to use certain of this content on my blog you’re mind. Natually I’ll give a link here we're at your internet-site. Appreciate your sharing. I was just looking for this information for a while. After six hours of continuous Googleing, at last I got it in your site. I wonder what is the Google's problem that does not rank this kind of informative sites closer to the top. Usually the top sites are full of garbage. Apparently doesn't work any more: nc no longer has -c on Ubuntu, and -l and -p are not allowed on the same call. that is a bacterial disease that responds to antibiotics. The identify is baffling but I didn't decide on it.